Blog – Page 2 – Clare Walks Ltd. The sun shone down on Connolly last Thursday as our Active Agers descended on the village to walk the newly developed Cloontabonniv Bog. The walk started at Carney’s Pub, just outside the village. We would like to say a huge thanks to Julie who opened up especially for us and who provided very welcome cups of tea and coffee and sweet treats on our return. We were joined on the walk by a large number of committee members from Connolly who have been, and are still, involved in the development of this bog walk to make it an accessible amenity and also to preserve it for future generations. It has certainly been a labour of love for this group over the last number of years. The stories we heard on route, from people who came to this bog as children, to the history of the bog and the families who worked it, made the morning all the more enjoyable for the walkers. A neighbour on the route even picked plums from the tree in his garden for us, and they were possibly the sweetest I have ever tasted. With stunning views of Mount Callan, surrounded by forestry, with streams running down the side of the road, we crossed over the start of the Inagh River and a even had a quick stop to watch a baby frog crossing the road – this was certainly a walk in nature. We all agreed that it was a very enjoyable walk. Well done to all involved in the Cloontabonniv Bog. Over 60 people joined us in Tulla on Thursday evening last for the Tulla Famine Week. This guided historical walk was jointly organised by Tulla Reaching Out and Clare Walks Ltd. to celebrate Heritage Week 2018. Jane Halloran, Dalcassian Origins, provided the historical information for this Famine Walk. The walk started outside Tulla Library and provided information on the people and buildings associated with the Great Famine 1845 – 1849 in Tulla. We heard of Fr. Patrick Sheehy, the Parish Priest of Tulla during the Famine and his Church of Ireland counterpart, Rev. Richard Brew who joined forces and seemed to put aside their religious differences to try and ease the suffering of the people of Tulla. The route took us passed the site of the former Coffin House on Main Street, where coffins for those who died during and after the Famine were made; The Soup (or Souper) School, a small Church of Ireland school which at its height, had about 160 Church of Ireland and Catholic pupils in 1846 & 1847. During the Famine, many children attended the school as by doing so, they were also entitled to a free meal; Tulla Courthouse, which was erected in 1838 and was the main judicial building for the Tulla district for almost 163 years. During the Famine, cases were heard for those accused of stealing. However, the Courthouse was also used for the meetings for the Tulla Poor Relief Committee; Tulla Bridewell or Gaol (now Minogue’s Bar) throughout the 1800’s was the building where prisoners were often kept overnight to appear in court the following day and also prisoners who were due to be transported to a new country as punishment for their crime would have been held here overnight. The final part of the walk brought the group down to the entrance gates of the former Tulla Workhouse. The Workhouse was completed on 22 February 1850 and started to take in the impoverished people of the area in 1852. Within several months of opening, it was overcrowded. These conditions continued to persist for several years. The high stone walls and galvanised gates guard the spot where the workhouse once stood – only one small pillar marking a former entrance and a very eerie tree remain inside the gate today. On our return to Tulla we were treated to a welcome rest in Minogue’s and an even more welcome cup of tea and biscuits.We would like to thank Minogue’s bar for making their facilities available. Again, we would like to say a huge thank you to all who joined the Tulla Famine Walk and we are already looking at ideas for future historic walks on the East Clare and the Mid Clare Way walking routes, so make sure to keep an eye on this website or follow us on Facebook. Want to experience the Lough Derg Blueway? Come along and enjoy a free Guided Walk on the Ballycuggaran Loop, along the East Clare Way walking route, where you will see the beautiful expanse of Lough Derg beneath you. 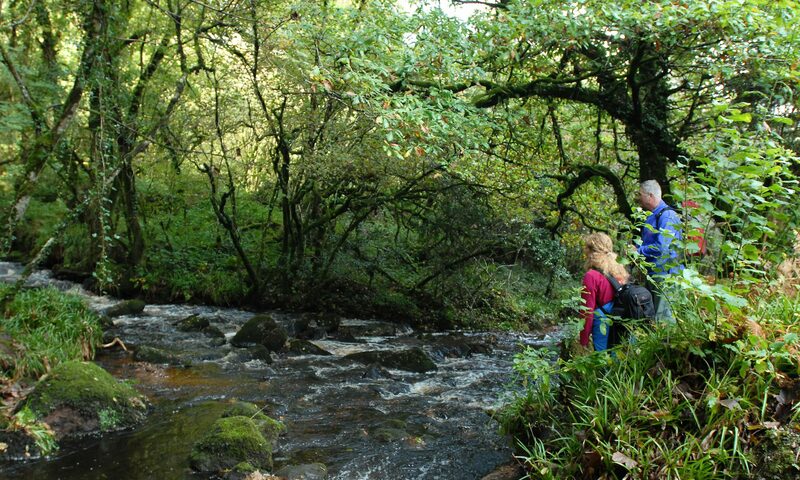 This walk is 7km and follows forest road, forest track and minor road through dense forest and open hillside on the shoulders of Feenlea Mountain and Crag. Please bring suitable walking shoes/boots, waterproof clothing and fluid. MEETING POINT: Two-Mile-Gate, Killaloe @ 11am. Due to current weather warnings in place, the Clare Walks Ltd. Guided Walk in Tulla will NOT go ahead as planned tomorrow (Thursday 1st March). We have re-scheduled this walk for Thursday 15th March 2018 at 11am. Apologies for any inconvenience caused. This guided walk will now take place on Thursday 15th March 2018 at 11am near Tulla. This walk will start at Ardboula Farmhouse which lies 4km from Tulla town. Ardboula Farmhouse is an 18th Century beautifully refurbished farmhouse located within a 33 hectare working cattle farm. Owners Christine and Willie O’Brien have been running this as a self-catering business since August 2014. There is free and secure parking at Ardboula Farmhouse. We will leave Ardboula Farmhouse and follow quiet country roads, which will lead us past rivers, forestry, unspoilt landscape and historical features. This looped walk is just under 9kms and will finish with an optional refreshment stop at Ardboula Farmhouse. The walk is mostly on flat surface. Please bring suitable walking shoes/boots, waterproof clothing and fluid. Have you ever wondered how to go about growing your own seeds or starting your own garden? It doesn’t really matter where you live, you can start growing. So why not buy one of our herb gardens hand made from left over wooden pallets? And check out these useful tips from our neighbours at Irish Seed Savers in Scariff.